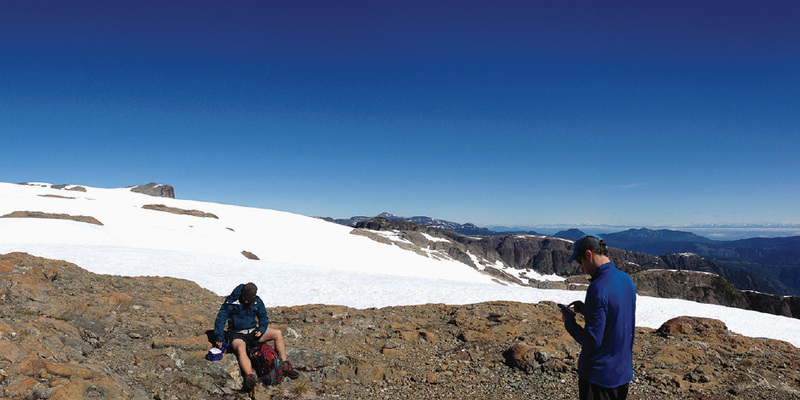 The Comox Glacier is such an iconic mountain for the Comox Valley. Since moving here in the fall of 2006, it’s been calling me to the top. I thought it would be pretty neat to get on top of a mountain that I see every day, but have always found access to the trail difficult. In the winter and early spring the road is open but usually covered in snow, prohibiting a drive to the trailhead. Winter trail conditions can be difficult and the road is often closed in summer because of logging operations. You can access the glacier from the Buttle Lake side, but the trip proves much longer. Last summer, with my friends Paul and Ryan, we decided to ascend the glacier as an overnight trip. None of us had ever been before and we were pretty excited. To get past the locked gate, we decided to bike out to the trailhead. So, in mid-July, we biked from our respective homes or workplaces to meet at the Comox Dam at 5pm. Ryan came from Royston on his fat bike, Paul came from work on his cyclocross, and I had the shortest ride from Marsden Road on my mountain bike. We had saddlebags and light backpacks to carry what we needed to hike, bike, sleep, and eat. It was a nice summer evening with clear skies as we departed out along the Comox Logging Road. On a pretty, undulating road along the lake, we took a snack break at the Cruikshank Canyon bridge. What a beautiful river! We then turned up the Cruikshank and started following those roads to the trailhead. Then things took a turn for the up. Way up. At one point, I walked my bike a bit until the road leveled out. It took us about 4 hours to get (approx.) 29km from the dam, according to Phil’s guidebook. We arrived at the trailhead at 9pm. Ryan got some water on to boil for our Backcountry Pantry dinners and then we passed the bags around so we all got a taste. We fell asleep under the stars, on the road, and cozy in our sleeping bags. The next morning we woke at 5am to find it was going to be a sunny, clear day. We ate breakfast, stashed our bikes in the bushes, and sorted out daypacks for the hike. By 6pm we were on the well-marked trail. After crossing the river, there are many switchbacks, so we stopped at the first viewpoint to compare sweat marks on our t-shirts. To be honest, we compared dry spots. It’s a beautiful trail with magnificent viewpoints of the glacier. It’s mostly a hiking trail but there are a few spots where you have to use your hands if you don’t want to fall. We topped out onto the snowfield at 10:30am for a break and then carried on over the snow-covered glacier to the summit. So awesome! What a view! Finally, we got to the top of the mountain that we see from the Comox Valley everyday. It felt terrific. After a nice 45-minute lunch/photo break we started down. We got back to our bikes at 3:30pm. It was still a beautiful sunny day. We shared 3 well-deserved dinners and an hour-long break. I wasn’t really hungry, but I knew I would need the food energy to bike out. We transitioned from hiking to biking and headed down the road at 4:30pm. It was a quick, downhill, 40-minute trip back to the Comox Logging Road. The whole bike out was much faster than I thought, as I was back at my house by 7pm. We decided to meet in Courtenay at the Gladstone Brewery for a pint and pizza, or as I called it, dinner number 2. I drove there, but the guys biked and Ryan even finished the trip by biking home. We were stoked! Now, when I look up at the glacier, I smile at the memory of that epic day.